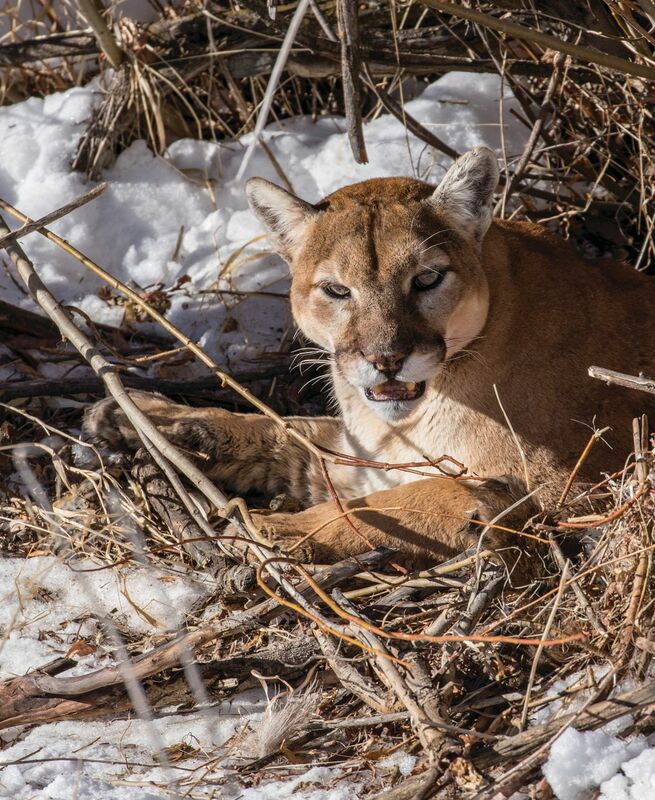 In the Vail Valley, mountain living means living with mountain lions. A mountain lion spotted in Edwards' Lake Creek area. I first discovered that a mountain lion had taken up residence in my suburban Edwards neighborhood in December, when my wirehaired retriever started ranging into a far corner of the Miller Ranch Open Space during our pre-dawn runs. Curious, one morning I decided to follow him—and with my headlamp found my dog, snacking on the remains of an eviscerated mule deer cached in a snowbank, the mountain lion equivalent of a storage freezer. On another sojourn a few dark mornings later, I nearly ran into my dog on the riverbank trail. As he stood on his hind legs like a griz sniffing at the air, I looked up with my headlamp and spotted a deer foreleg dangling from a branch. At around the same time, Mirabelle chef Daniel Joly sent me a text. No words, just a photograph from a cell phone camera: a lion bathed in moonlight, standing in the snow outside the restaurant’s dining room, glaring defiantly through a pane of glass at the picture-taker. An omen, because on my next run, my dog bawled at the deer-leg tree but this time sprinted away. Suspended shoulder-high in the inky blackness above the frozen river, a pair of owlish eyes glinted green in reflected lamplight. As I trotted past, instead of the expected bird, I spied a cat as big as my dog curled on a branch, staring.